SITE MAP CEIOLAI, rhymes with "gay-oh-lie"
One of the world's great cities. Bergonia's largest city, with a current population (2000 census) of 11.2 million (same size as Paris, which Bergonians regard highly). One of Bergonia's two capital cities, and the sole capital until 1938. Elections are certified here and inaugurations occur here. The supreme court and many ministries are located here, including the justice ministry and most ministries involving the economy. The major television networks are headquartered here. The largest, most politically dominant city in ancient times. As abundant in archaeological, historical & architectural riches as any place in the world. Ceiolai is, after all, over 2,500 years old. Also capital of the State of Rarsecin, whose population is 15.5 million, Bergonia's second largest state. For Bergonia it's Rome and New York City combined. The most revered gem of Bergonian civilization, the seat of ancient empires, and the cultural center of the modern nation. Ceiolai is situated along the western shore of the the narrow finger lake called Coclu-- "the Black Water." Lake Coclu drains southward into the Bergoli river. A hundred different architectural styles, dense neighborhoods, meandering streets crowded with small cars, motorbikes & pedestrians, street markets and small arcades, narrow pedestrian alleys, walled courtyards, intimate shaded neighborhood plazas, innumerable sidewalk cafes, wide tree-lined avenues connecting grand public buildings, monuments and statues at intersections, huge hillside parks overlooking the dense city center, ancient and medieval ruins scattered everywhere, snarled traffic above-ground and a superior subway system with spacious stations below. 498 BC -- founding of the city, according to ancient history adopted by the First Empire. 350-100 BC -- First Ceiolaian Empire dominated eastern Bergonia. The city's maximum population during this era is estimated at 200,000. 85 BC -- the banda warriors from the west invaded the empire, defeated the Ceiolaian Imperial Army in the Battle of Sheilor, and took the city. 235 AD -- founding of the Second Ceiolaian Empire, which grew to dominate almost all eastern and central Berg. 579 AD -- Prakai-Eleusi attacked the Second Empire from the west and took over one third of the empire's territory. Yet he failed to take the city itself. Pop. probably peaked at 1,300,000. 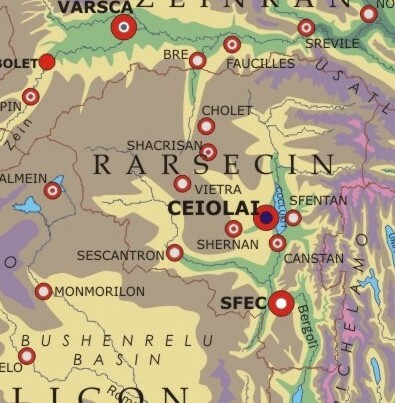 649 AD -- Collapse of the empire; Ceiolai reduced to governing only its locality. The city's population fell, but stabilized at around 700,000-800,000. 1555 AD --Ceiolai's independent republic fell to French arms during the course of the killing plagues. Pop. falls to under 100,000 after the plagues pass through..
1780 AD -- Peislei proclaimed the independent Republic of Bergonia in Ceiolai, and Ceiolai became the capital of the new state. Pop. 270,000. 1931, 1934 -- At the beginning and the end of the Revolution, Ceiolai saw serious street fighting with many casualties. Ceiolai's personality is quite the opposite of Lefitoni, Bergonia's other great city. While many parts of Lefitoni are carefully planned, with straight, wide avenues, Ceiolai's narrow streets twist and meander willy-nilly, with no grid or plan whatsoever. This is a city of neighborhoods, thus has a closed-in feel, so that nearly every location feels intimate. Ceiolai seems like an endless expanse of three and four story apartment buildings built around courtyards. A handful of large plazas provide open space, but most plazas and all the parks are divided by trees, unobtrusive statuary and rich expanses of flowers. The modern city extends twelve miles along Coclu's shore, and then spreads westward, filling up the flat land, and then up and over hills and ridges, so that the terrain in the western half of the city is very hilly. One of Ceiolai's most attractive places is known (in English) as Flowercrest, a 46 acre hillside park planted thickly with flowers, casting a quilt of color across the crest of a steep hill, visible from two miles away. The emperors of the 2nd Empire founded this garden. Though two superhighways loop around to the west of Ceiolai, no superhighways penetrate the city's core. A proposal for bringing expressways into the city center is always pending, but the opposition to tearing apart neighborhoods is insurmountable. The subway system itself is a marvel, thankfully as big and as efficient as any in the world, started in 1942 and completed in 1982. It is a huge system, carrying a great volume of passengers, since vast numbers of Ceiolaians have come to rely on it for basic transportation. Some subway stations are vast underground galleries lined with produce markets, shops and restaurants that allow commuters to complete errands as they travel through the system. Many underground spaces are adorned with wood paneling, unique in the world, marble, pools and waterfalls illuminated with colored lights, and banks of flowering plants cultivated under grow lights. There are also underground pedestrian walkways and moving platforms (like the ones in the big airports) that provide shortcuts under many city blocks, past hundreds of underground stores. The longest of these meanders three miles under the central city. When Harmony took over the city government in the 1984 election, it closed off many streets to motor traffic (except for buses, delivery and emergency vehicles). Harmony also provoked controversy by ordering businesses to pay a "bike bonus" to any worker who rode a bicycle to work. Worker-owned corporations were loath to punish their own members-- especially those in no shape to pedal to work. Some fraud resulted. Then one eventful day the outspoken chair of city council-- a Harmony stalwart-- was spotted riding in a limousine. Outraged citizens surrounded the limousine and forced him out the vehicle. An angry man armed with felt pen and newspaper fashioned a "dunce cap" labeled "hypocrite" and slapped in on the embarrassed politician's head just as the newspaper photographer showed up. This one incident more than anything else contributed to Harmony's humiliating loss in the next election, and contributed to Harmony losing control of Congress in 1988. Ironically the succeeding NDP government retained all of Harmony's changes, save for the "bike bonus." Millions of tourists annually visit Ceiolai's Old Lakeside District to admire the many venerable buildings and structures from ancient times. The obligatory tour starts with the Vestarai-- the huge Shufrantei-Mihradi temple dedicated to Arkan and Icotesi. The main sanctuary, built under a dome, is huge. It was built in the early days of the Second Ceiolaian Empire-- finished around 340 A.D. The plain facade was rebuilt in the 700s. The tourist leaves the Vestarai and walks south across Zereitlemar, a vast lakeside brick plaza, almost a mile from north to south, that served as the heart of the ancient city. It has been rebuilt countless times since the city's founding. In the midst of this vast space is a fine obelisk done in the graceful curving Bergonian style, built in 1181 AD, 386 feet high. A fifth of this 30 acre plaza has been given over to a huge open air crafts market surrounded by street vendors of food, film, and tourist crap. In Zereitlamar, by the lakeshore, stands the white marble Temple of Anramapral. The temple was built during the First Empire, probably completed in 310 B.C. At the south end of Zereitlemar the tourist reaches the grand entrance to the Tufralan, the walled city of emperors. During the 400's A.D. the emperors of the Second Empire built a walled citadel to protect their palace and to house their government. A seventy foot high wall enclosed a half square mile. The enclosure originally contained a fabulous capitol building and a gigantic palace, as well as temples, administrative buildings, schools, courtyards, gardens and plazas, and a vast army barracks. The Emperor Garon built a tower on the edge of the Tufralan to appease his wife's vanity. His single spire, supported by four buttresses, reaches upward 389 feet from just behind the palace along the wall. A later emperor built the external gate. Later emperors derived great pleasure from its view of the lake and the city. The tower still stands, as do the capitol building, the great stone barracks, and the towering walls themselves. Fires consumed most of the other imperial-era buildings long ago, including the Imperial Palace. Successive regimes built newer structures, so that the contemporary visitor sees many different architectural styles. The National Museum of Antiquities, completed in 1910, is the only structure built within the Tufralan since 1492. The tower and the Tufralan front gate facade are Ceiolai's signature landmarks, like the Kremlin, the Eiffel Tower, the Statue of Liberty, and the Brandenburg Gate. Old Town extends westward from Zereitlamar to Palashaba Hill. One walks these sidewalks of brick though a jumble of architectural styles-- a few gems surviving from before 1493, a great many fine brick and stone homes from Colonial times, and thousands of townhouses from the Early Republican Period, and a few apartment buildings from the late 1800s.. The residents here enjoy the combined favor and curse of stringent preservation regulations. The streets are narrow and winding, but there are a few fine wide thoroughfares, laid out by the ancient emperors, and many small plazas and open market spaces. Here one finds innumerable cafes, bookstores, political offices, cafes, small galleries and studios, tailors, shoemakers and jewelers. Bureaucrats who work in the neighboring ministry buildings live here, alongside artists and artisans. Old Town is bound on the north by Heavenly Promenade, a wide tree-lined boulevard leading from Zereitlemar up a gentle grade for a mile onto Republican Hill. It runs into Sonai Plaza, located atop the Republican Hill. Congress House: There on Sonai Plaza stands Congress House, the capitol building constructed in 1816 during the First Commonwealth in a straight-forward neo-classical style with very few pre-columbian indigenous influences. This served as the nation's congress building from 1817 to 1937. Its facade is formed by a plain row of columns under a forward roof canopy, in turn under a higher level, with a row of windows, under a long formal roof from front to back. In the rear of the building, behind the main legislative chamber are wings of office and hearing rooms, forming courtyards. The nation's Congress meets here ceremonially once a year. Before 1816 the capital was located in the coastal city of Sonai. The capitol building constructed here stylistically echoed the building used in Sonai, the Hotel du Sonai. The plaza in front of the new capitol was named for the old capital city. Other Government Buildings: Congress House is surrounded by other government buildings, built in the same decade in the same style, including the Surpreme Court Building, the Palace of Justice, the Chancery, the Ministerial Palace and the President's House (nicknamed Usaiamet, "Oakmont House"). The politicians knocked down many old venerable buildings in constructing Heavenly Promenade and the Congress House, arousing so much ire that no one has dared touched Old Town again. Many of the significant events of modern Bergonian history have been played out in Congress House. Revolutionary blood has several times stained the bricks of the Plaza, and thousands of demonstrations have marched up Heavenly Promenade. Along the Promenade and surrounding Congress House one finds many fine buildings, all with neoclassical facades, constructed in the 1800's to house ministries. The two most impressive of these buildings house the supreme court and the chancery. Many tourists visit Old White, a massive fort of white granite built by Zati, the founder of the Second Empire, to house imperial troops, imposing, with hugely thick walls, everything on a slightly monstrous scale, majestic, and kind of creepy. For centuries afterwards regimes have used it variously as a prison, a barracks, a granary, a warehouse-- usually a combination of these things. Old White stands on Karon Plaza, a nice large open square, one of the few places where traffic can accelerate. Tribute Boulevard connects Zereitlamar to Karon Plaza. Just as Tribute Boulevard reaches the crest of the hill and enters into Karon, it passes under the great arch built by Zati. Others visit Gavasha-- which is Minidun for "university"-- officially known as the "August University of Ceiolai"-- a campus of 2,211 acres with both medieval and modern buildings, the nation's largest library, and a fabulous archaeology center that compliments the National Museum of Antiquities. Museum of Medicine and Forensics Galen was the Greek founder of medicine, and Imutala was the half-legendary healer in ancient Bergonia who is credited with saying that the emotions live in the flesh and that emotional balance is almost crucial to physical health. The Galen and Imutlala National Hospital is one of the nation's most prominent medical universities. It houses the International Museum of Medicine and Forensics, a fantastic place with everything from mummies, shrunken heads, stuffed animals and strange things in jars, skeletal remains, medieval torture instruments, medical devices, surgical tools, prosthesis (including Michel Peislei's wooden false teeth), famous firearms, weapons and ballistics, and exhibits on notorious crimes. People stand in lines to get into this museum. While it has some of the same appeal as a carnival freak show or a roped-off crime scene, it is entirely and impeccably credible in all its presentations, and also appeals to the same interests as the popular American CSI television series. Museum of World Cultures The Museum of Medicine & Forensics works in conjunction with the Museum of World Cultures, the world's largest museum archeology and anthropology, with a massive collection of cultural artifacts. It is remarkable for the building's central corridor, 80 meters long, with its walls entirely covered with masks-- the world's largest collection of ceremonial masks. Also is the Ritual Theater, where rituals-- weddings, healing and blessing rites, initiations-- from archaic cultures worldwide are recreated for audiences. The Bergonian Museum of History, with artifacts from throughout Bergonia's long history, from antiquity to current times, so also a museum of archeology, is located on the city's south side. The building was raised in the 1940s, done in the style of a Tan-era library, and regarded as one of the most beautiful buildings in the city, appearing on innumerable postcards for tourists to buy. Here are the essential documents of national history on display (Michel Peislei's Call to the Nation, and the Covenant of 1840) for the public to view. Here are also proudly displayed aircraft and spacecraft. There are no large museums devoted to painting or sculpture, but the Museum of World Cultures has integrated into its holdings a good collection of paintings. Ceiolai is therefore not a great destination for serious art students-- other Bergonian cities have excellent art museums-- but Ceiolai is probably the world Mecca for those interested in archaeology and anthropology.